September 13th, 2017, English Harbour, Antigua: We were very lucky here in Antigua to escape the recent storms; the island is virtually unscathed. We have been overwhelmed by and very grateful for all your messages of support. As we gear up for another Caribbean yachting season, our boatyards, marinas, docks and anchorages are intact and for our charter and service companies, it’s business as usual. Planning for our upcoming regatta season continues apace as we look forward to some brilliant sailing and yachting. Antigua continues to offer the perfect winter escape – sunshine, steady trade winds and, of course, our famous Antiguan hospitality. Even though the hurricane devastated many islands including our sister island of Barbuda, we know that the region will bounce back stronger than ever. The beauty of our islands and people, combined with our passion for yachting, will continue to win people over from around the world and ensure that events and the communities that host them overcome obstacles and remain ready to welcome you back to their shores. To assist our island neighbours, shipping and logistics company Peters & May, the Antigua and Barbuda Tourism Authority, the Antigua and Barbuda Marine Association and Antigua Sailing Week are working together to host a Caribbean Cocktail and Fundraiser during the Southampton Boat Show on Thursday 21st September at the Peters & May stand. If you would like to attend please RSVP to marketing@sailingweek.com. Funds raised for relief efforts at the event will be shared equitably among the islands of Barbuda, St. Maarten/St. Martin, St. Barths, Anguilla, BVI and USVI. The docks at Falmouth Harbour Marina looking left to the Antigua Yacht Club Marina and out to the harbour. Slipway Boat Yard taken from the docks in Nelson’s Dockyard Marina with the newly restored Clarence House to the left. Antigua Yacht Club Marina taken from upstairs at the Antigua Yacht Club complete with ABSAR rib on its boat lift. 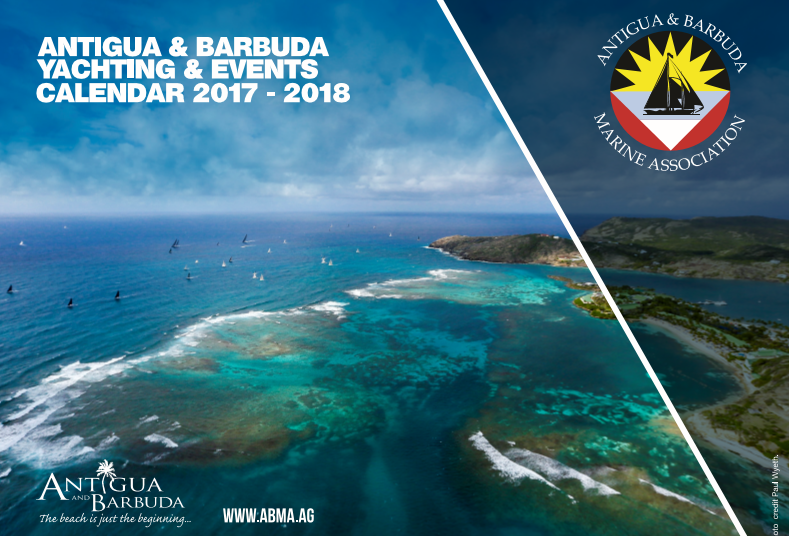 The Antigua and Barbuda Marine Association (ABMA) is the private sector organization which is the unified voice of the yachting industry in Antigua and Barbuda. It represents marine organisations to the government and stakeholders and the industry to the world. Updates on events and a full list of members can be found on the association website www.abma.ag. A list of reputable agencies collecting donations on behalf of Barbuda can we found here http://www.antiguanice.com/v2/client.php?id=806&news=10249 . We are currently working with other islands to establish a similar list. 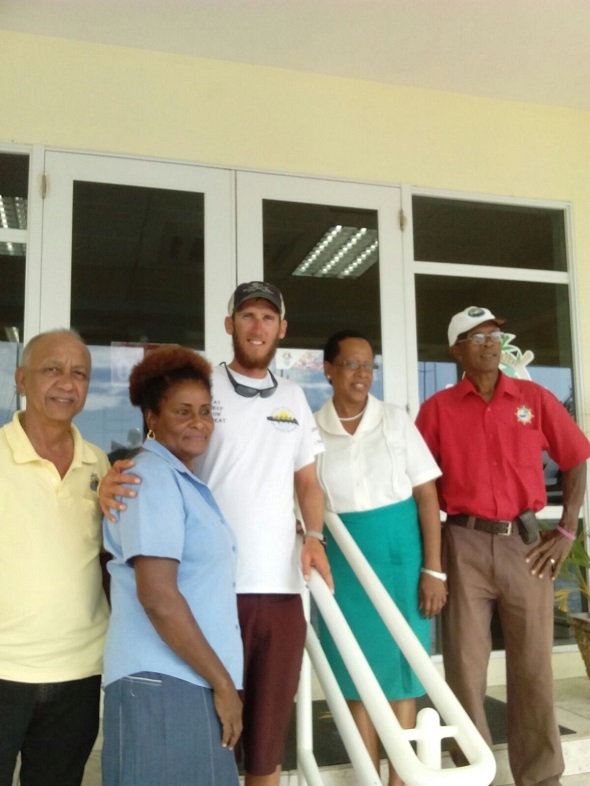 JD Hall, of Team Wadadli stopped by Falmouth Harbour Marina less than 24 hours after arriving back in Antigua to say thanks for the major sponsorship received from Falmouth Harbour Marina to enable the Team’s participation in the Talisker Whisky Atlantic Challenge. General Manager, Bobby Reis welcomed him and expressed pride in the magnificent achievement of Team Wadadli. St. John’s, Antigua. February 1, 2016. 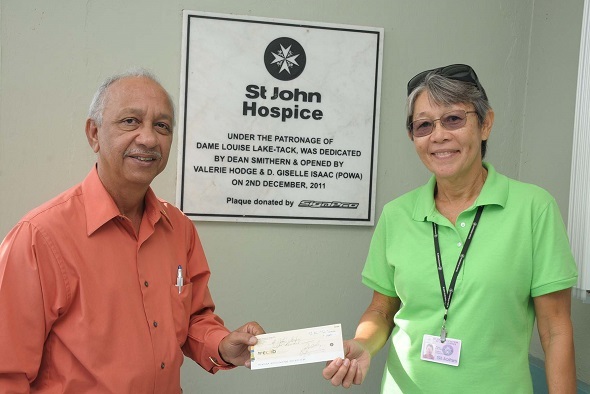 Falmouth Harbour Marina has become the latest company to donate to the St. John Hospice. However, as the Company’s General Manager, Bobby Reis explained, this is not their first donation. “Falmouth Harbour Marina is the sponsor of the Lord Nelson Pursuit yacht race which takes place on Old Year’s Day annually. When we were approached to sponsor that Race in 2014 we were told that all sponsorship funds raised would be donated to the Hospice. So we made the first donation for Old Year’s Day 2014 and this $5,000 donation today is in fact for the last Old Year’s Day race. Falmouth Harbour Marina is the country’s premier mega yacht marina and is owned by all indigenous Antiguans. It began operations in 1997. Falmouth Harbour Marina is the only Marina in the English Harbour area where your service containers can be kept within the secured premises of the marina making it the perfect base for campaigning yachts through the season. Be sure to reserve your space early as space really does fill up fast.